I love revisiting my past cocktail recipes. 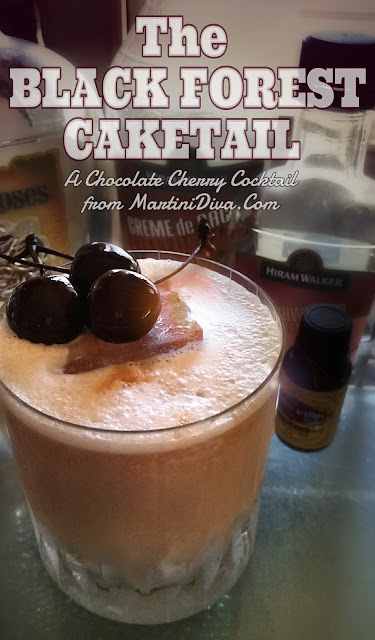 With National Black Forest Cake Day being March 28th I thought it might be time to have a new take on my original Black Forest Cake Martini. Back in those days I was big into all the flavored vodkas, these days I'm exploring whiskies and decided it was time for a bourbon Black Forest Cake in a glass. Think of a creamy Chocolate Manhattan or a maybe Fancy Free Cocktail but with Kirsch instead of Maraschino liqueur, creme de cacao added and the bitters changed to chocolate instead of orange. 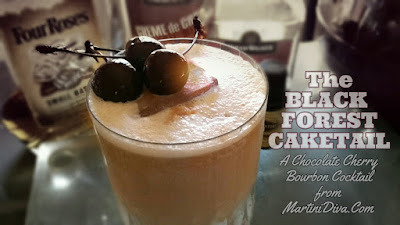 Before I added the creme de cacao it reminded me a bit of Cherry Bounce, a Colonial cocktail of cherries and sugar fermented in brandy or whiskey. Not a bad thing at all. Adding the creme de cacao is an even better thing. DIRECTIONS Chill glass in the freezer. Shake ingredients with ice until chilled then strain into ice filled glass. Top with whipped half & half. Do not stir, it will gently settle into the cocktail by itself. Tap a few drops of extra bitters on top. Garnish and serve. National Black Forest Cake Day is March 28th.